Welcome to this practice guide for the Jazz Piano Foundations Course. Below this video you can download these PDF practice plans, which cover all of the important exercises and drills to master the theory in this course. The document contains 6 different theory areas. Depending on how long you have to practice, you will either spend 5 minutes or 10 minutes on each of these theory areas. The benefit of splitting your practice time into small chunks, is that in just 1 sitting, you can cover a wide selection of different theory topics. There are only 12 of these to learn, and they really are the foundation of all future study of harmony. Learning them thoroughly at this stage will help greatly as you are exposed to more challenging jazz theory and concepts. We know that every major scale has a relative minor scale. If we want to find the C Natural Minor Scale, we simply play the major scale from a minor 3rd up. A minor 3rd up from C would be Eb major, and if we play the Eb Major Scale from C to C we get the C natural minor scale. This relationship works in every key. Now the natural minor scale can be played over minor chords, but there are other scales which give in my opinion much nicer colours and flavours. The major and minor triads are the most important at this stage of your development. In the Triads lesson in this course we did look at the other types of triads which are diminished and augmented triads. It’s useful to understand what these are and how they are constructed, but learning the major and minor triads is our priority. A 7th chord is a triad with the 7th note of the scale added to create 4 note chord. When we get to the 7th chord and beyond, our chords start to sound rich and jazzy. Diatonic means “belonging to the key” and remember a key is effectively a scale and so diatonic chords, means the chords of the scale. In every major key, the diatonic 7th chords share the same quality… 1 & 4 are always major 7th chords, 2, 3 & 6 are always minor 7th chords, 5 is always a dominant chord, and 7 is always a minor7b5 chord. This is the most important exercise so far. 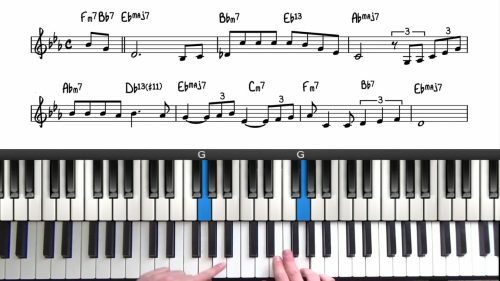 Pretty much every jazz standard contains a 251 in some form and so when you know this progression in all keys, you will be better prepared to read from lead sheets. For the remainder of your practice time, I want you to watch the recommended jazz standard lessons on this plan. 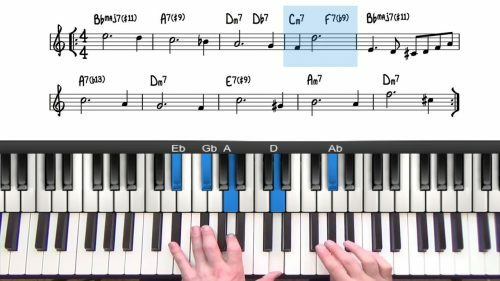 This is the more enjoyable side of learning jazz which is why these jazz standard studies are a core part of the PianoGroove learning method. Follow this plan until you are comfortable with the theory exercises. This will take time so don’t expect it to happen overnight. Always remember that mastering these exercises is a gradual process that you will take over many months or even years. Don’t worry about getting them 100% right now, because when you practice other more advanced jazz theory, you will always be revisiting and refining your knowledge in these foundational topics. 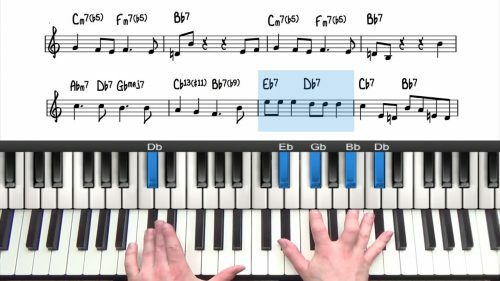 When playing jazz standards, take the time to identify each note of the chord, say to yourself "that's the 3rd", "that’s the 7th" etc… and gradually you will build an awareness of where everything is located.